Relax with a piña colada and a magazine while the kids splash in the pool. Enjoy some fresh air and Instagram-worthy views of Waikiki on your own balcony. There's no need to skip your daily workout, the onsite fitness center has you covered. Head to the lobby for the weekly Manager's Reception with wine & cheese, live music, and Hula dancing. Gorgeous grounds and luxe pools make Luana the perfect spot for a romantic getaway. This casually elegant resort hotel is situated in the heart of Waikiki, less than a mile from Kahanamoku Beach, Fort DeRussy Beach Park, and Duke Kahanamoku Lagoon. Start enjoying resort amenities first thing in the morning, with a complimentary yoga class (held four days a week) and free coffee in the lobby. For days you feel like sticking close to home-base have everyone put on swimsuits, sunscreen up and head to the pool. While the kids are searching for dive sticks and playing Chicken, park yourself on a lounger with a piña colada and catch up on this week’s People Magazine. If you’re feeling more active, suggest a family bike ride. Take advantage of the resort’s complimentary loaners and ride along the Ala Wai Canal to watch the ships go by. The concierge is your new best friend, offering insider tips on dining, shopping and more. Three nights a week, enjoy live Hawaiian music and hula dancing along with wine, cheese and local craft beer at the Manager’s Reception. The tropical décor in all condos put you in instant vacation mode. Inviting studio condos sleep four and include all the basics you will need for your beach vacation. Kitchenettes come equipped with the essentials. Upgrade to a one-bedroom condo for more living space and a full kitchen. Recruit the kids to help bake your famous chocolate-chip cookies – not that they’ll need convincing. There’s no need to worry about missing the big game or your favorite show, all condos have flat screen TVs with premium cable. The kids will love the PlayStation 3 gaming console, which doubles a blu-ray player. Bring your favorites from home or visit the DVDNow rental kiosk for unlimited movie and game rentals. Coin-operated laundry facilities onsite means more room in your suitcase for souvenirs. 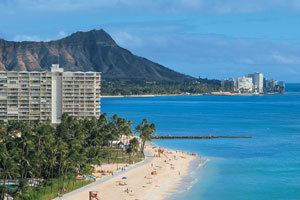 The resort is steps away from Fort DeRussy Beach Park. Work on your sun-kissed look while the kids build the sandcastle of all sandcastles. Gather the shopaholics in your crew and take advantage of the resort’s complimentary shuttle service to Ala Moana Shopping Center. Treat yourself with a relaxing massage or manicure at Ho`ala Salon and Spa. Shopping for a unique souvenir? Get creative and design your own pair of "Hawaiian slippers” at the Flip Flop Workshop. Surprise the animal-lovers in your crew with a trip to the Honolulu Zoo (42-acres and home to 905 different critters) or the Waikiki Aquarium. - Kids stay free! Up to 2 children 18 years old and younger stay free when using existing bedding. - Rollaway/extra beds are available for USD 30.00 per day.